This beautiful city will make you succumb to its chocolate charms. Welcome to chocolate paradise! Rausch is passionate about chocolate, with a restaurant, cafe and shop all dedicated... to chocolate. 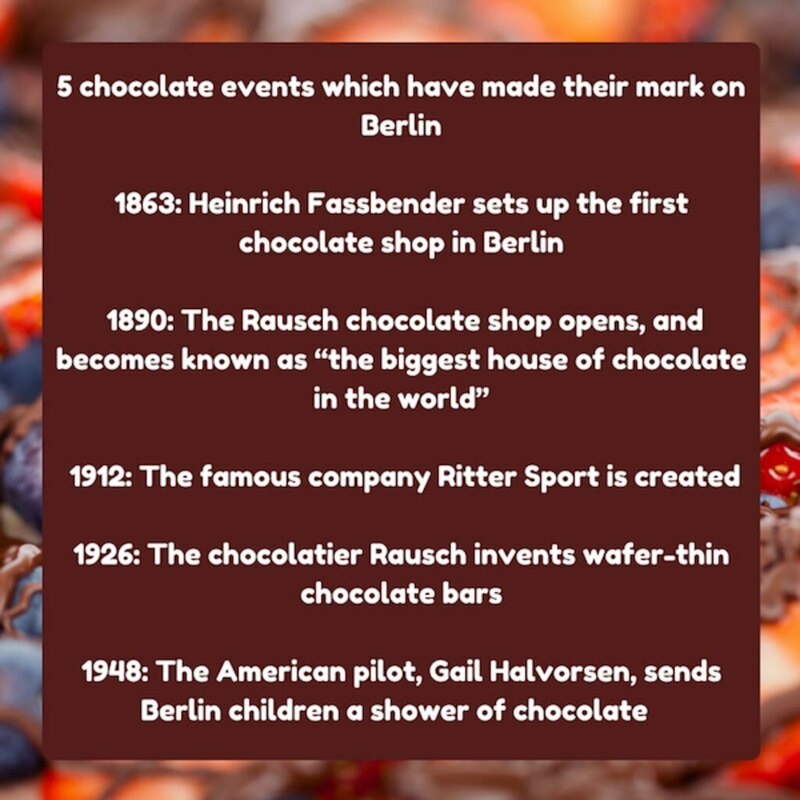 The family business was founded in 1918 and opened its enormous house of chocolate, located on the famous Gendarmenmarkt in the Berlin-Mitte district, in 1999. Try a delicious Black Forest gateau with a creamy hot chocolate. Right at the heart of the charming Schöneberg district, there is a place that you simply must visit: Winterfeldt-Schokoladen. In 2009, this chocolate hotspot made its home in an old pharmacy, designated as a cultural heritage site. The period setting is in perfect contrast with this modern city. At Winterfeldt, time stands still and you can take some time to drink a delicious coffee, accompanied by handmade pralines. Ritter Sport chocolate bars are all the rage in Germany. So it is no surprise that the brand has opened a gigantic flagship store called Bunte Schokowelt in the capital. Here you will find flavours you've never seen before, limited editions and giant bars. Which would you choose: cashew & raisin, strawberry & yoghurt or honey, salt & almond? This small German-Californian chocolate producer promotes authentic chocolate. The young business is dedicated to organic produce and fair trade. To this end, its owners have bought 150 acres of land in California to grow their own cocoa. The result is melt-in-the-mouth chocolate which is well worth discovering! It's hard not to fall in love with the sublime chocolate biscuits sold in this charming cafe. You may not even dare to bite into their hand-decorated biscuits. Multi-coloured birds, butterflies, flowers... the creativity of this small chocolatier, with its pretty decor, knows no bounds. Don't forget to take photos of your purchases. You'll want to post them on Instagram! For more than 70 years, this confectioner has offered a vast range of delicacies. Take advantage of your trip to Berlin to book yourself onto a patisserie/chocolaterie course at the Confiserie Mélanie. There you will learn the secrets of the art of praline. This unusual activity will delight your family and friends when they taste your creations. In Berlin, they love all things French. It was therefore only natural that Master Pâtissier Christian Jossien should move to the German capital. At "Glaçon de Christian", you will enter chocolate heaven. Make sure you taste the famous "glaçons" which have given their name to this chocolate hotspot. The ingredients of this unique chocolate? Hazelnut paste, cocoa paste, cocoa butter, milk chocolate, white chocolate, almonds, vanilla, icing sugar. Dreams really do come true! For those who don't speak German, here's a little explanation of the shop name. In German "Sünde" means "sin", the perfect name for place that sells such devilishly good chocolates! In this chocolate shop with its intentionally old school feel (cosy armchairs, religious images on the walls, old stove, etc. ), you can try pralines, chocolate cakes or a good cup of steaming hot chocolate. 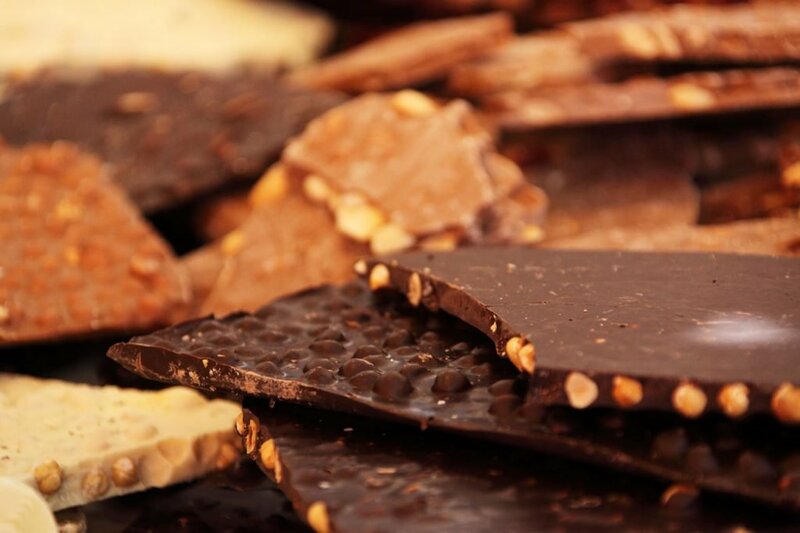 Don't hesitate to chat with the charming owner to learn more about the secrets of chocolate! The Germans are mad about cake, and the bigger the slice, the better! Chocolaterie Catherine understands how to make this into its greatest asset. A piece of cake could easily replace your evening meal. Everyone can find their piece of happiness here. We recommend trying the chocolate and strawberry cake and the chocolate mousse. At Hamann Bittere Schokoladen, they have perfected the art of bitter chocolate! Founded in the 1920s, this chocolate shop has managed to maintain its bygone charm thanks to its period interior decor, traditional packaging and real traditional craftsmanship. The perfect opportunity to purchase a pretty box of assorted chocolates. Will you take just one praline for the road? 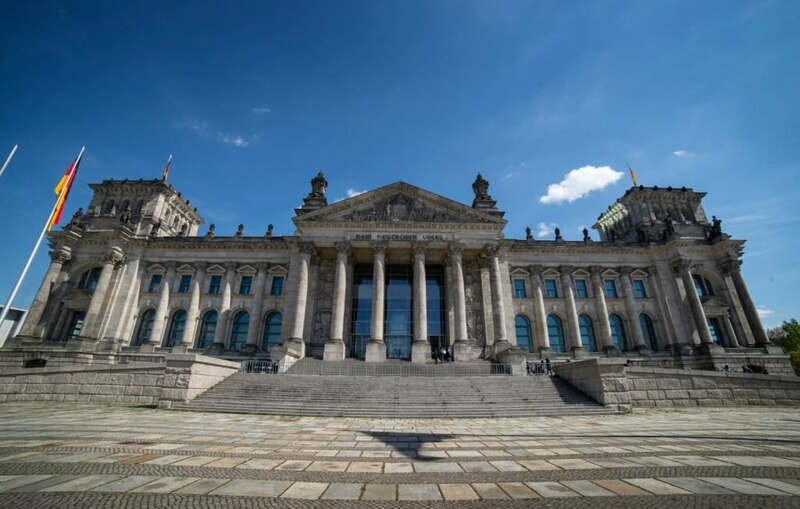 In 1948, Berlin suffered under the blockade imposed by the Soviet Union. For 462 days, Western forces flew over this area, separated from the rest of the city, to supply food items by air in the famous Berlin Airlift. Gail Halvorsen, an American pilot who was responsible for delivering these food supplies, came into direct contact with a few lonely and starving children while he was filming in this controlled area. He promised to "bombard" them the next day... with chocolate. A promise that he kept and will always be remembered by the city of Berlin! This cake, meaning "cold dog" in English, is made of shortbread encased in chocolate icing. This staple in German cuisine is a real delicacy and well worth trying!